How do I get them blurred? You need to check BlurDeviation and HideBlur settings in Dwm..and also read bibmuscles Guide on his website. Classic Shell will also facilitate the blurring of the Taskbar. You have to choose the "Disable Taskbar Transparency" setting. I have the problem that after every new start (or log out) of Windows 8.1 the taskbar isn't blurred anymore. So I have to enter the both commands for SetWindowCompositionAttribute (in CMD) again. What can I do? I just bought StartIsBack and is a perfect replacement to make it look like Windows 7 for the taskbar/startmenu. I was using Stardock Start8, and this I actually like better. 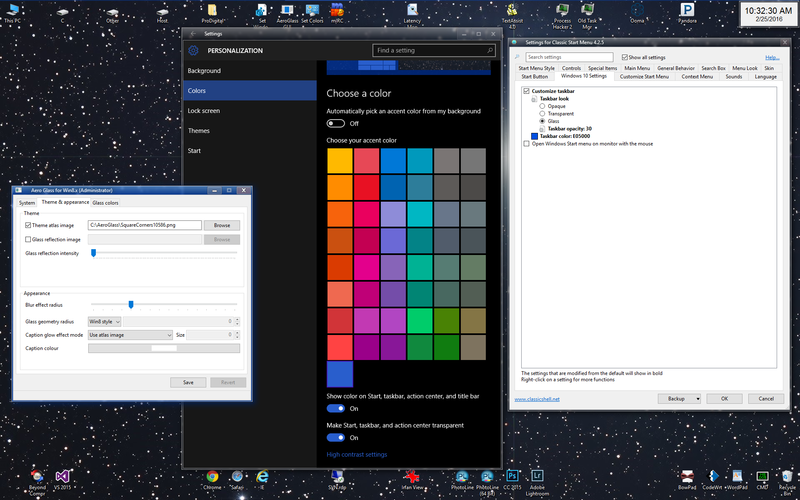 Doesn't follow the colour used by classic shell start (disabled control from there) and windows frames colorizations (colour picked from sliding wallpapers). I saw to disable accent color (what I've to edit?) but I don't lost windows frame/start colourization editing in this way? Keep at it, a consistent blue Aero Glass-based theme doable with some effort.